This past Saturday morning in Houston, Local Lodge 811 Women’s Committee held their 3rd annual Memorial Cancer Walk. The goal of the event was to raise awareness for those impacted by cancer – caregivers, families and patients alike. The walk was part of Houston’s annual IAM Union Picnic. 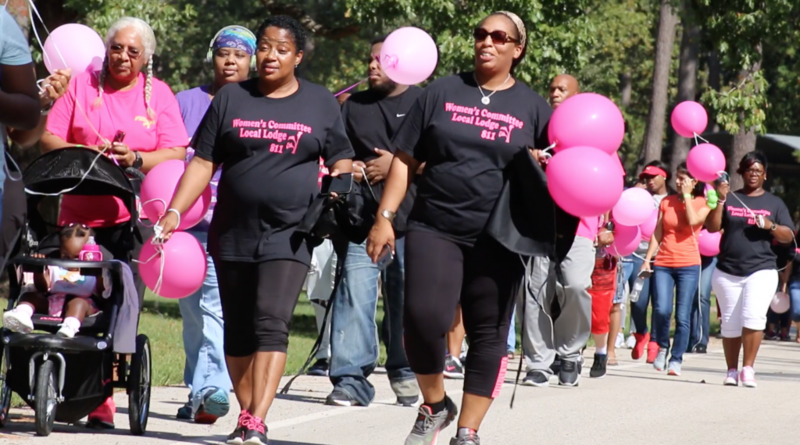 Among the activists participating in the event were cancer survivors, families of survivors, and those who were walking in honor of others who have passed away. The project began three years ago, led by Local Lodge 811 Women’s Committee Chairwoman, Jackie Golphin. Jackie is a cancer survivor who wanted to find a way to encourage women like herself to get early screenings. Jackie approached United Airlines managers at IAH in Houston about including public service announcements to promote cancer screenings as a regular part of the company’s health and wellness messaging. Hub Manager Becky Alberts was willing to partner with the Women’s Committee – and Breast Cancer awareness became a top priority at the Houston airport. Today, thanks to the activism of Local Lodge 811 Women’s Committee, travelers that pass through Houston’s international airport will see pushbacks, baggage carts, tugs and other heavy equipment painted bright pink. To date, the Memorial Cancer Walk has helped drive the message that early screenings save lives to an audience of several thousand IAM Union members in Houston, including Locals 811 and 2198. Local Lodge 811 Women’s Committee hopes to grow the program so that it can reach more people, and inspire more women to become activists in their communities.